As part of our mission to contribute to the development of quality new Australian musical theatre works, the VCA welcomes special guest Stephen Schwartz for the American Society of Composers, Authors and Publishers (ASCAP) Musical Theatre Workshop. Sadly, we have encountered significant scheduling issues in bringing Stephen Schwartz to Australia in February 2018. Due to these unforeseen circumstances, we have decided to postpone Stephen’s visit and consider other opportunities to host him in the future. 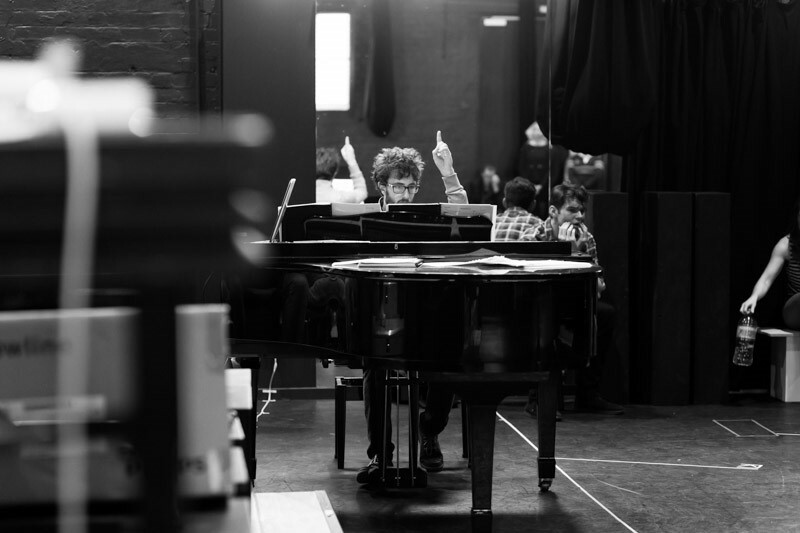 Musical director Adrian Portell works with students on the 2014 VCA production of A Little Touch of Chaos by Peter Rutherford and James Millar. Photo: Drew Echberg. Returning to Australia for the first time in seven years, the ASCAP Musical Theatre Workshop, with the support of Australasian Performing Right Association Australasian Mechanical Copyright Owner’s Society (APRA AMCOS), provides local writers and composers of musical theatre the opportunity to present their work to a legend of Broadway and Hollywood and receive the benefits of expert critical feedback and mentorship. ASCAP and Stephen Schwartz (Wicked, Pippin, Godspell) have successfully run workshops with emerging musical theatre talent globally for thirty years. This workshop will provide Australian writers and composers the opportunity to present their works-in-progress to an expert panel, led by Schwartz, who will provide critical feedback over a week in residence at the VCA. The Victorian College of the Arts is calling on musical theatre writers and composers to submit proposals to participate in the ASCAP Musical Theatre workshop. To be considered for the opportunity, please first refer to the Terms and Conditions, the University of Melbourne's Privacy Statement and the Frequently Asked Questions below. Three songs from the work in the form of: Lyric sheets, sheet music, and song files. Works will be assessed by an expert panel on the basis of their artistic merit and originality (taking book, lyrics and music into consideration) and capacity to benefit from this creative development workshop process. Two works will be selected to prepare a presentation of 45-50 continuous minutes of their submitted work to a panel that will include Stephen Schwartz. Teams will participate in a feedback session of approximately 60 minutes with the panel, led by Stephen Schwartz, and will then have the chance to develop the work further in residence at the VCA over the course of the following week. Teams will have negotiable access to resources provided by VCA, including rehearsal space and support from the BFA (Music Theatre) community during this time. At the end of the week, teams will present their progress in a second workshop and receive further input from the panel. The workshops will take place during the fortnight commencing 12 February 2018. More information regarding the opportunity will be provided to selected applicants. Call for submissions will close at 11.59PM on 14 August 2017. The workshop has been organised in Melbourne by the Victorian College of the Arts in partnership with ASCAP, and their Australian counterpart APRA AMCOS. What experience do I need to submit? Anybody is eligible to apply; you do not need to have had work produced previously. Does my work have to be about Australia? The work is required to be considered "Australian" as per the definition in the Terms and Conditions, but does not necessarily need to be about Australia or Australian culture. Do my songs need to be recorded in a professional studio? No. We are looking for content and compositional quality, not professional production. Can I submit supplementary materials? No. We will only consider the materials requested on the submission form. There is no cost to submit for the workshop. However, should you be successful, there may be costs involved in travelling to the workshop and pulling together performance and crew talent to present. Be sure to consider accommodation, rehearsal and production costs. If/when you and your team are in Melbourne, the VCA is willing and able to provide some rehearsal space by negotiation. Please direct your enquiries to newworks-musictheatre@unimelb.edu.au. Do I have to use VCA students in my presentation? You are responsible for finding your own cast and crew for the workshops, however if you do wish to incorporate third-year students into either presentation, this can be negotiated by contacting newworks-musictheatre@unimelb.edu.au. It is a requirement that third-year students are able to observe the creative development process between workshops. Is there any funding available for interstate/international travel or accommodation? Neither the VCA nor University of Melbourne will be providing funding to cover costs of applicants. Due to conflicts of interest, we are also unable to provide individualised supporting materials for funding applications. Applicants can seek funding independently. If any of our partners can provide discounts or support we will notify the selected applicants cohort. How much material do I need to be able to present? You will need to present 45-50 minutes of fully-rehearsed continuous content of your submitted work to the panel. Can I submit work at very early stages of development? Do I need to have completed the work? Works should be completed to a full draft. Bear in mind that you will need to present 45-50 minutes of consecutive material (e.g. an Act) and provide a complete synopsis of the entire work. You may also be asked to speak to the arc of the whole piece. What if my work has been produced before? Works that have received previous development support either by the VCA or any other body are welcome to apply. However, if the work has been previously performed for a paying audience it is not eligible for consideration. The ASCAP Music Theatre Workshop is proudly supported by APRA AMCOS. For more information about the ASCAP Music Theatre Workshop, send us an email.